Frame and Frequency: Challenging New Exhibit Coming to Gallery 135 | Sumter…In the Middle of Everything! In the midst of end-of-school/beginning-of-summer/oh-gosh-it’s-getting-hot, and everything else that accompanies this time of year—well, here’s something a bit different. A lot different, actually. 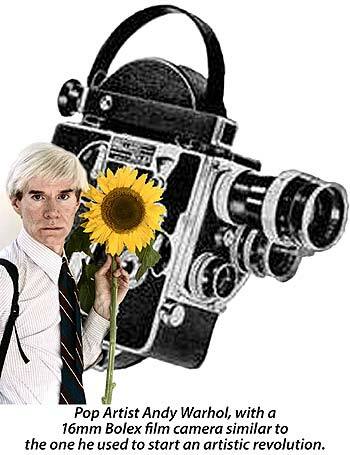 In 1963, former commercial illustrator Andy Warhol began pointing his 16mm film camera at whomever walked in the door of his New York studio, The Factory. Since that time, video has become an integral part of many forms, such as installation and performance art, and a powerful medium in its own right. Artistic barriers crumbled as the stillness of sculptures and paintings came up against the immediacy of the new form—the first truly “new” artistic medium in centuries. Over the last five decades, the rise in news coverage that brings world events into our living rooms in real time, changes to Hollywood codes that have led to ever-more daring and experimental cinema, the proliferation of cable television, MTV, video games, and nearly countless other influences, our lives are now virtually saturated by moving onscreen images. Nearly everyone you know probably has a YouTube channel, and our mobile phones can capture live action to share with thousands at the click of a button. The Museum of Modern Art provides a fairly detailed explanation of the phenomenon on its website here. 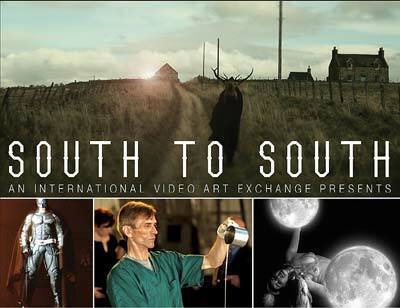 As part of its ongoing challenge “to engage community members of all ages in the creation, contemplation, and appreciation of the visual arts,” the Sumter County Cultural Commission presents the first exhibition from the South to South International Video Art Exchange Program — “Frame & Frequency” at Gallery 135, located at Patriot Hall on Haynsworth Street. Co-curated by Sumter County Gallery of Art curator Frank McCauley, along with Liliana Hernandez and Victor Muñoz, the exhibition, opening on June 6, highlights the work of twelve international artists—from Bogotá to Medellín, Colombia (i.e., “South” America to “South” Carolina—get it? ), from Canada to California, and of course, New York City—whose new media, experimental film and video works explore contemporary visual culture. The “intimate panorama” encompasses the variety and breadth of video art today, including themes such as video as a medium, documentation of a performance, and more. “Frame & Frequency” is proudly presented by the Sumter County Cultural Commission, in collaboration with the Sumter County Gallery of Art, Bivouac Projects, and PLECTO Galleria de Arte. The opening reception will be held on Friday, June 6, 2014 from 5:30 to 7:30 p.m.; the exhibit will remain in place through July 18th. Admission is FREE, and the public is invited. Patriot Hall Performing Arts Center, at 135 Haynsworth Street, is open Monday – Friday from 9 a.m. to 5 p.m. For more information, please call Patriot Hall at (803) 436-2260. Even for people who aren’t usually interested in galleries or museums, this groundbreaking event promises to be an extraordinary experience. For some, it will be a revelation. From others, it may elicit a shake of the head and a puzzled, “Um, what was that?” For all, it is bound to inspire thought. And this much, you can count on—it won’t be boring! Join the artists and their works, and check it out! This entry was posted in Sumter SC Tourism, Sumter, South Carolina, Visit Sumter SC and tagged arts, film, gallery, Gallery 135, history, installation art, National Endowment for the Arts, Patriot Hall, performing arts, SC, SC Arts Commission, South Carolina, Sumter, Sumter County, Sumter County Cultural Commission, Sumter County Gallery of Art, visual arts. Bookmark the permalink.